The sixth edition of the IceCube Masterclass program will take place on January 30, March 20, April 4, and April 11, 2019. 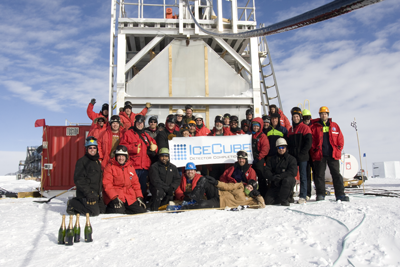 The IceCube masterclasses will be held at nineteen research institutions in the US and Europe. We invite our young students—our future scientists—to learn about particle astrophysics by doing real research. IceCube is an amazing experiment. It is the largest detector ever built, is taking data in the harshest place on Earth, and has observed the highest energy neutrinos ever. Cool, right? IceCube is a team. A few hundred scientists, with the help of engineers, drillers, IT experts and many other technical staff, have made this project possible. Will you join us? Participate! You will analyze actual IceCube data: signals from tiny particles, called neutrinos, that have traveled through the Universe over astronomical distances, bringing us information about extreme objects such as black holes or gamma-ray bursts. What is an IceCube masterclass? Watch the videos on the right, recorded at Vrije Universiteit Brussel (www.vub.ac.be) during the 2015 edition, to learn more about the masterclass and how much the students liked the experience. The IceCube Masterclass program is inspired by the International Masterclasses program, started in 2005 by the International Particle Physics Outreach Group and supported in the USA by QuarkNet.